What the Heck is a “Negative Savings”? WEST BEND — After 12 months of collecting data from employees and their families regarding the onsite health clinic, officials have received information they hope to use to mitigate rising health care costs for their workforce. Sara Stiefvater, the client operations manager, along with Regional Medical Director Dennis Schultz, both from Quad Medical, presented results of the operations for the onsite health clinic Monday to members of the Common Council. She also provided information regarding the clinic’s profitability when combined with Washington County since the clinic is shared between their employees. In the aggregate, officials experienced a negative savings for the first year by slightly more than $22,000. The total estimated savings was about $332,000 while the expenses, which includes staff as well as the payment to the vendor for operating the clinic, was about $355,000. That’s the oddest way to say that… “experienced a negative savings” of $22,000. In the real world, we would day that it “costs” $22,000. This is significant because the whole point of the county and city providing a clinic is to bring down the overall costs. Otherwise, it’s just an additional benefit to government employees. The impact the clinic will have for the city and county, at least in terms of savings and cost, is significant because that is the primary reason that administrators and leaders established one. The clinic opened during the summer, marking the completion of a project that required about two years inthe hopes of slowing the increasing rate associated with health care costs. If the goal is to save $1 million in three years, then the clinic needs to save $511,000 each of the next two years. I don’t see that happening. That being said, I would consider the clinic a success if it saves some decent amount each year. For example, if it saves the taxpayers $50,000 per year and provides a better healthcare alternative to employees, then it’s a net benefit worth keeping. If it is just going to be another perk for employees that costs taxpayers even more, then it fails to meet its stated justification and should be shut down. Let’s give it another year and see how it goes. Before he became the father of Texas, Stephen Fuller Austin served for a time in the territorial legislature of Missouri. He was a savvy, energetic legislator whose personal interests often aligned with the interests of his home district of Washington County. For example, Austin aggressively pushed for a tariff to protect lead mining, the primary business in his district and his family’s business. He also advocated fiercely to get the government to grant a more favorable charter to the Bank of Missouri, of which his father was a founding director. Both efforts were intended for the benefit of his district and Missouri with the convenient side effect of directly benefitting Austin and his family. The blurring of public and personal interests by elected officials is as old as representative government itself. 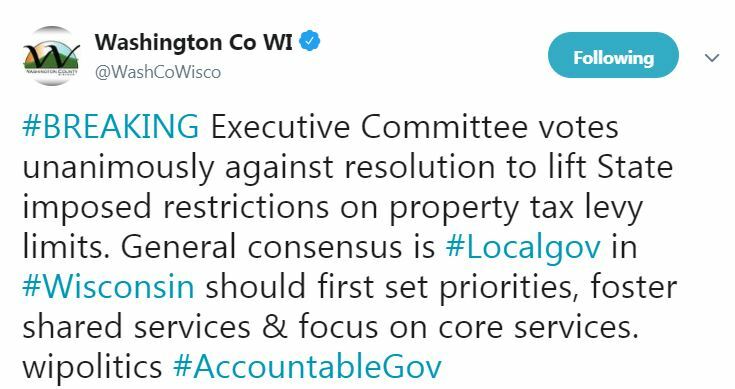 This blur came to the fore in Wisconsin’s Washington County and has resulted in county leadership essentially forcing a supervisor to resign. When the Washington County Board supervisor for District 11 moved away a few months ago, the County Board appointed a replacement, William Blanchard, to serve out the rest of the term. On Oct. 3, Blanchard submitted his resignation “under duress” due to an insurmountable conflict of interest. At issue is the fact that Blanchard’s daughter receives significant care from various county departments. Upon investigation, county officials determined that because so many departments were involved, the only way to avoid the potential conflict of interest was for the county to outsource his daughter’s care to another county, at significant expense, or for Blanchard to resign. The Washington County Ethics Board issued an opinion that although there was no “wrongdoing or ethical violation … there is a conflict of interest,” and “Blanchard should resign.” To that end, County Board Chairman Don Kriefall, County Administrator Josh Schoemann and County Attorney Brad Stern told Blanchard that he needed to resign. In this case, the potential conflict of interest exists if, and only if, Blanchard uses his office or votes on issues related to services that his daughter receives. The simple solution, which Blanchard offered to do, is for him to recuse himself from such votes. This is common and routine for elected officials. The Washington County Board, like every elected board, is riddled with conflicts. Supervisors and their families work for the county, use county services, serve on municipal governments, work in businesses that do work with the county, etc. It is impossible to have an elected county government full of citizens who do not actually live in the county. For Blanchard, county officials insisted that they would need to outsource services for his daughter to avoid a potential conflict. Why? Again, the simple and cheap solution is for Blanchard to recuse himself if there is a conflict of interest. Outsourcing services to another county just to avoid a potential conflict of interest with one supervisor is an expensive overreaction. It is not the county’s duty to avoid the conflict. It is the supervisor’s. If the supervisor commits an ethical offense related to a conflict of interest, then the County Board can take action. What is concerning about this is that county officials constructed an unreasonable standard to force an elected official out of office. Blanchard was faced with either resigning or being responsible for forcing the taxpayers to pay thousands of dollars of additional costs to care for his daughter. He was forced into this decision even though the simple act of recusing himself from relevant votes would have adequately sufficed to avoid a potential breach of ethics. The downside of Blanchard’s potential conflict of interest is that he may have to skip a lot of votes. This would bring into question whether or not he is adequately representing the citizens of his district. But that decision is not for the county administrator, county attorney or County Board chairman to decide. That decision is up to the voters of District 11. Washington County’s leadership undermined the tenets of representative government when they forced Blanchard to resign. It wasn’t their call. It should have been left for the voters to decide. My column for the Washington County Daily News is online and in print today! Go pick up a copy. Here’s a taste. For example, Austin aggressively pushed for a tariff to protect lead mining, the primary business in his district and his family’s business. He also advocated fiercely to get the government to grant a more favorable charter to the Bank of Missouri, of which his father was a founding director. Both efforts were intended for the benefit of his district and Missouri with the convenient side effect of directly benefiting Austin and his family. Even more at the Washington County Insider. If this is the case, it’s an egregious abuse of power to force a board member out. Why? The conflict of interest issue doesn’t make any sense. There must be more to the story. I am writing to you today to notify you that I will be, under duress, submitting a letter of resignation tomorrow as District 11 County Board Supervisor. I will be resigning because my mentally ill daughter is receiving services through Washington County Social Services (tentatively through January 2019). Due to my place on the County Board, her services would have to be outsourced to another county and would cause Washington County to incur additional costs of between $4,000 & $20,000. I would have been willing to forego my salary to cover the additional expenses but wasn’t given that opportunity. I would like to highlight that there are currently no ethics breaches or perceptions of breaches. The County Attorney has even written that he does not allege that I “am in breach of the Code of Ethics… or that you are not an ethical person or a man of integrity”. Under duress, I was forced to request a determination from the Ethics Board which found “not based on any wrongdoing or ethical violation” that there was a conflict of interest and recommended that I resign from the County Board. I am truly dismayed and disheartened at the treatment I have received throughout this process. Rather than look for, or accept, alternative solutions, I have been coerced, threatened and intimidated into this course of action. I have enjoyed getting to meet all of you and wish you the best in your future endeavors. Having submitted my resignation, I will address this as a private citizen of Washington County. I have stated before that I am willing to discuss the issue openly and honestly with anyone interested. In a nutshell, I was Kavanaugh’d. I have not done anything wrong, nor have I, unlike Kavanaugh, been accused of doing anything wrong or unethical. If you would like to discuss this further, please feel free to reach out to me. I would like to notify you that I will be submitting ethics complaints against Chairman Kriefall and Administrator Schoemann. On a phone conversation they suggested (by suggested I mean pushed, forced, threatened) that I resign and then lie to my constituents and tell them that I have family issues and don’t have time to fulfill my County Board requirements. I replied by stating that the Air Force has three core values: Integrity First, Service before Self, and Excellence in all we do. While those may be a punchline to some, those are the values by which I try to live my life. I will be open and honest with my constituents. At that point they tried to backpedal but the unethical suggestion had already knowingly been made. I have received multiple communications from several Supervisors about the email you received from Supervisor Blanchard today announcing his intent to resign as a County Board Supervisor. As with all Board communication I highly advise you to refrain from any discussion amongst yourselves regarding this matter, including any ‘Reply’ or ‘Reply All’ to the original email from Supervisor Blanchard. I only give this advice as the matter may relate to the Open Meetings Law, as it may or may not be discussed by the County Board and as it has been considered by the Ethics Committee. I was thrilled when I learned that the County Board Supervisor position for District 11 was open and even more thrilled when I was appointed to that position in August. I am devastated that I am now forced, under duress, to resign from my position as Washington County Board Supervisor for District 11. Over the past few weeks, I have been subjected to harassing calls and threats to resign or else… Why am I being forced to resign? NOT because I have done anything wrong or committed any ethics violation but, rather, because my mentally ill daughter is receiving services from Washington County. Therefore, with a heavy heart, I submit this letter as my resignation from my position as Washington County Board Supervisor for District 11. Now Don Kriefall, Washington County Board Chair, responds to Sheriff Schmidt’s column from the other day. This is an important discussion for the future of Washington County. Go read the whole thing on the Washington County Insider. One of the initiatives discussed with Sheriff Schmidt was to offer to Washington County partners the ability to provide dispatch services for them at no cost. Funds saved by each municipality could then be earmarked to maintain or repair roads. As many municipalities had passed resolutions requesting a portion of the County sales tax, primarily due to the rising cost of roads, this would save those municipalities more than the amount of sales tax that they had requested. The ability to allocate District Attorneys to prosecute cases more efficiently. The ability to repurpose each County Jail/Circuit Court and make them juvenile holding facilities and courts. All local police officers would be hired by the Sheriff’s Department and assigned to their local communities. As stated, these are some out-of-the-box solutions that could create efficiencies without negatively impacting services, and in most cases actually provide better services. I agree with Sheriff Schmidt that agencies that are too small struggle to meet the needs of the citizens they serve. The population of Washington County is 135,000, 30,000 more than Green Bay, so I would challenge the assertion that it would be too big to be personal and responsive to the community. Where I totally disagree is his perception that this is a political struggle. The constitutional authority delegated to a County Sheriff does not require a “fight” or an adversarial relationship with the County Board. It requires that we work together collaboratively to better serve the citizens of Washington County. We will continue to explore ways to provide the best possible services that positively impact the quality of life for the citizens of Washington County. In response to Sheriff Schmidt’s op ed yesterday, Steve Gonwa wrote a very interesting response over at the Washington County Insider. Go read the whole thing, but here’s a bit. From my experience within Washington County, what is happening is accurately described by Sheriff Schmidt. What is apparently occurring is an undisciplined quest for regionalization and centralized power in county government without regard for the impact such action would have on its citizens. I find it disturbing that an environment has been created in Washington County government whereby such grandiose and misguided concepts are now not only embedded in the thinking of its top leaders, but encouraged by the administration to the point of folly. It is not surprising that this is the environment created by the County Administrator Josh Schoeman and members of the Executive Committee. Make no mistake, changes made to the County Board in recent years under Mr. Schoeman have systematically stripped the board of most of their decision-making powers and empowered the governance of the county to Mr. Schoeman, the County Board Chair and the handful of supervisors on the Executive Committee. Past County Boards in my opinion mistakenly allowed this to happen, as we are now seeing the depth of the problems created by these changes. I support consolidation of services when it can be accomplished in a responsible and fiscally prudent manner, and when the overriding goal remains the provision of efficient services to the community. But what started as reasoned attempts at consolidating some specific county services with adjacent counties has clearly morphed into something far more reaching and potentially irresponsible. Mr. Schoeman and the county have, with some success, consolidated a Health Department and a Medical Examiner Office with Ozaukee County and Waukesha County, respectively. Perhaps less than 50 employees were affected by these consolidations ( the county floated the concept of a combined Highway Department with Ozaukee County and it proved to be too difficult to even get beyond a basic discussion ). To think that county leadership now believes it has the knowledge, experience and capability to pursue multi-county consolidations of public safety services involving hundreds of employees, millions of dollars in resources and a vast array of critical services shows a serious lack of insight and common sense. I, for one, have no interest in living in the consolidated world of Joshington County. This is certainly better than the message we’re getting from state lawmakers. [West Bend, Wisc…] Washington County thinks it can fund all its highway improvements over the next 32 years without an increase in the gas tax or raising other taxes and fees. The plan is simple: make transportation infrastructure a top priority in its budget. That is the cornerstone of the county’s 2050 Transportation Network Sustainability Plan, which officials are promoting through the #JustFixIt campaign. Washington County wouldn’t be the only county to figure out how to fund road repairs without a tax hike. Marquette County has managed to maintain the best roads in the state through prioritization just within its highway budget. That’s resulted in 99 percent of Marquette’s county highways being in fair or better condition. Incredibly, the county receives almost the smallest amount in state aid of any Wisconsin county.